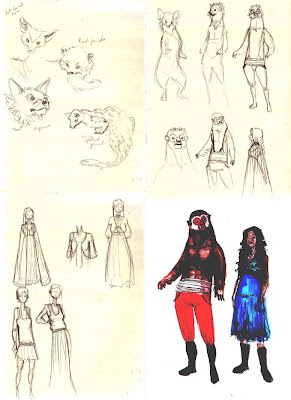 So, the process of coming up with a character design for the Beast. corner are some that I did there (when I wasn't jabbing small children with a sharpened pencil for getting in the way. Not really. I just wanted to. Bloomin cheek they've got, running round enjoying a child-friendly museum). have been eliminated at an early stage, when its too late to do much about it. In this case I'm glad I worked through civet- and dog- based ideas early on (see the early sketches in the top right hand corner). After that I hit on something pretty close to the final design pretty quickly. I think this is because I was utilising a lot of the work I've done over years in drawing another character - Iorek Byrnison from Philip Pullman's His Dark Materials (relevant bit's about halfway through post). To me, the word Beast conjures a very mammalian creature, and if you want your Beast to be at all appealing, fur helps. 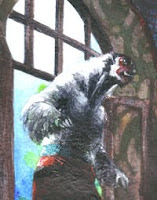 But I didn't want the Beast to look too friendly, and I think this is why I started thinking along the same lines as Iorek Byrnison: reducing the proportional size of the head and eyes to make the character a little inaccesable and hard to read; more imposing. The other consideration with Beauty And The Beast is while the Beast is just that, you have to try and make him not appear so animal that it seems weird that human Beauty falls in love with him. Can I just take this opportunity, by the way, to point out what an odd fairy tale Beauty And The Beast is? Whereas tales like Cinderella and so on seem to have a fairly clear morality and absolutely archetypal plots, Beauty And The Beast seems to me to be something more rich and complex. Anyway; bears and apes/monkeys struck me as the animals with the most obvious human-like physicality. I'd already thought about Iorek-style-beariness for the Beast's body and I liked the idea of contrasting that imposing bulk with quite a delicate, clever almost-human face based on a monkey's. I think the final design looks a little like some depictions of the Chinese Monkey King. He's somewhere between a bear, a silverback gorilla, a monkey and a sloth. Putting trousers and boots on him pulls him a little more towards the human end of the scale. So that's about it. All in all a design I'm pretty pleased with.